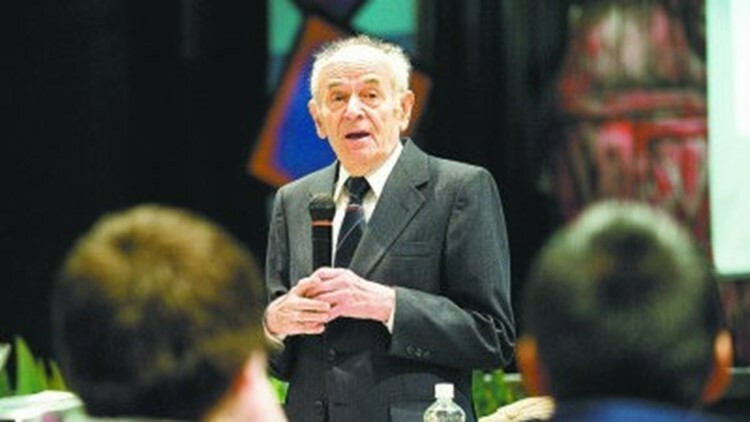 Holocaust survivor Alter Wiener, seen speaking to students in a photo from his personal website. HILLSBORO, Ore. — A man who died Tuesday night after he was hit by a driver while crossing a street in Hillsboro was a 92-year-old Holocaust survivor. Alter Wiener was taken to a hospital after the crash and pronounced dead, according to Hillsboro police. The crash happened shortly before 5 p.m. on Northeast Century Boulevard, north of Northeast Brighton Street. The driver stayed at the scene and will not face any charges or citations, Hillsboro police said. Wiener is the author of "From a Name to a Number: A Holocaust Survivor's Autobiography". He moved to Oregon in 2000 and often shared his life story at area schools, libraries, churches and other venues, according to his website. In a tweet Wednesday morning, U.S. Sen. Ron Wyden said he was devastated to learn of Wiener's death. He called Wiener "a true Oregonian and total mensch who transformed his Holocaust survival into a lesson that taught all of us about the need to fight prejudice always and everywhere".